An increase in fire activity was observed on the both the Zitziana River (#133) and Mooseheart (#204) fires Sunday afternoon. Significant activity was reported on the southeast and northwest corners of the Zitziana River Fire. The Mooseheart Fire, just to the west of the Zitziana, also became more active; mainly on it’s eastern side. An increase in activity and smoke is possible again today. Westerly winds could bring smoke into the upper Tanana valley. The 122 personnel assigned to the two fires continue to improve firelines and point protection efforts for cabins and homes on Kindamina and Mooseheart lakes, along with Native allotments and cabins along the Tanana River. The Zitziana River Fire remains at an estimated 34,380 acres and the Mooseheart Fire is an estimated 53,365 acres. With the increase in activity, minimal growth on both fires can be expected in the coming days. The two lightning-caused wildfires are approximately 100 miles west of Fairbanks and 8 miles south of Manley Hot Springs. A temporary flight restriction (TFR) remains in place over the Mooseheart and Zitziana River fires. Pilots should go to http://tfr.faa.gov/ to check NoTAMS before flying anywhere in the area. Tatalina River Fire (#245) — 58 acres, 0 personnel, approximately 45 miles northwest of Fairbanks and 5 miles east of the Elliott Highway, lightning caused on June 15. The eight smokejumpers assigned to the fire completed work and were demobilized from the fire on Sunday. The fire was placed in monitor status. Louise Creek Coal Seam 2018 Fire (#254) – 778 acres, 44 personnel, 5 miles northeast of Healy, started by a coal seam fire on June 19. Due to the hazards presented by coal seam fires, fire managers are employing a confine and monitor strategy on the fire, which is burning in a fire scar from previous coal seam fires. Fire activity was minimal on Sunday with only smoldering in the interior portion of the fire. Crews on Sunday continued thinning and making improvements to an old dozer that was re-established as an indirect containment line on the west size of the fire, from Walker Dome to Lignite Creek. The line has been plumbed with hose and pumps in the unlikely event fire activity increases and crews need to return to conduct a burnout operation along the line. All equipment was demobilized from the fire Sunday and crews could be demobilized in the coming days. Hadley Fire (#258) – 0.3 acre, 0 personnel, 20 miles southwest of Fairbanks on the Tanana Flats, human caused on June 20 and under investigation. The North Star Type 2 Crew completed work on the fire and it was called controlled and contained. The crew was demobilized and transported back to Fairbanks by boat on Sunday. The fire was placed in monitor status. 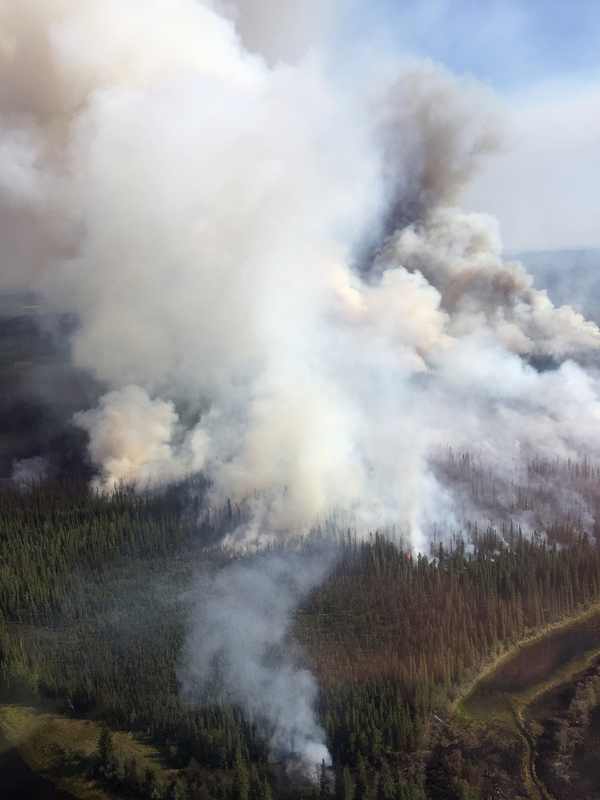 Mosquito Creek Fire (#262) – 3 acres, 0 personnel, 40 miles southeast of Fairbanks and 6 miles northeast of Harding Lake, started on June 20, under investigation. Firefighters gridded the fire several times and found only one hot spot, which was extinguished. A helicopter was used to back haul supplies off the fire. The eight smokejumpers assigned to the fire were demobilized Monday morning. The fire was placed in monitor status. Top of the World Fire (#267) – 31 acres, 0 personnel, 8 miles west of U.S.-Canada border, started by lightning on June 21. The fire was called controlled and contained at 11:45 a.m. Sunday after extensive gridding and mop up. The 16 smokejumpers assigned to the fire were demobilized Sunday afternoon. The slight increase in acreage was due to more accurate mapping. The fire was placed in monitor status.